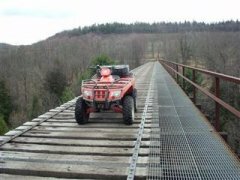 Is there anyplace I can down load gps atv tracks for Pennsylvania or parts of it? I have a GPX file of Snow Shoe Rails to Trails which has all the mile posts so you know where you are relative to the trail. It also includes the legal township roads. They are in KMZ format to upload to a GPS unit and display as a custom map on screen. This website does not allow uploading of KMZ files as attachments. I use a GPS for several hobbies and have software that allows me to calibrate maps to use in the GPS unit. I do have some saved GPX tracks from my rides but I don't know how useful they would be. Tracks I have would be riding these state trails, AOAA, and the Northcentral ATV project area. Thank you, not sure where we are going to leave to Tuesday morning, aleganey, whiskey springs, bloody skillet or ssrt. Use to go to whiskey springs often but have not ridden since they rebuilt it, more have I been to the others. The reclamation project only affected one area of Whiskey Springs. There are still other old mining areas to play in. The area was contaminating Kettle Creek. Keep in mind the state trails are closed until the Friday before Memorial day weekend. SSRT is open, but riding is limited. Actually I am incorrect, I can upload KMZ files as attachments. So I have a 2003 Polaris Predator 500 completely built and running. And then I have a 2004 Polaris Predator 500 completely disassembled. I've got the suspension, handle bars, steering and bottom of the motor on the brand new frame (previous frame was totaled, that's why it's disassembled). Everything else is in boxes. I've done all sorts of repairs on quads, ATVs, dirtbikes, snowmobiles, boats, cars...was a mechanic by profession in the 80's and wrenching my entire life. Done top end rebuilds on multiple bikes over the years. But I've never put a box of parts together like this. It shouldn't be hard as I have a running bike to look at and I have the factory service manual as well as a print of the polaris parts manuals. My question is in the best order to put this thing together. I can't locate a set of instructions to follow. I can figure it out without instructions but I find that instruction guides save me a lot of time. I'd like to get this thing running by June and it will be an after work, weekends project. Any pointers on the order of assembly...where to start...would be highly appreciated. Where to shop for parts? I've got a Polaris and a Honda that I use regularly on my ranch so they see a lot of abuse. Fortunately, there is still a Honda dealer nearby but the nearest Polaris dealer is over 1.5 hours away. They charge way too much money ($1800 for battery, alternator, wire harness and fluids change) so I am starting to learn how to do my own repairs. The Internet is a wonderful and scary place when it comes to shopping. Where can I go for a fair deal? Is there a list of preferred vendors that advertise on the forum? Backcountry Tracks Do'in Some Spring Track'in ! !